Don’t know your EPP from your elbow? We’ve got you covered. 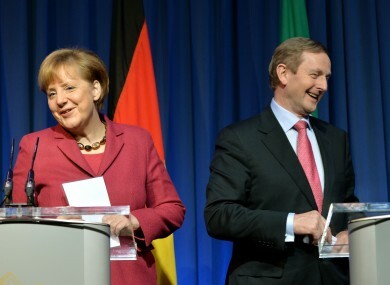 Sure we're great friends: Angela Merkel and Enda Kenny at the EPP conference in Dublin in March. THIS WEEK’S EUROPEAN elections will provide one of the few chances Irish people get to have a say in how the EU will run over the next five years. The European Parliament is the only directly-elected institution in the Union. It represents more than 500 million citizens in 28 member states. The European election will take place in Ireland next Friday, 23 May – on the same day as the local elections. The day of the vote varies from country to country, from 22-25 May. But how exactly do the Parliament and other institutions in the EU work? What do MEPs do in Brussels and, to a lesser extent, Strasbourg and Luxembourg? Six institutions are tasked with running the Union. These are divided into 3 areas: directing the political agenda, making laws and carrying out administrative functions. The European Council deals with political agenda and is formed of all the heads of member states. The three law makers within the EU are the European Commission, which comprises a Commissioner from each member state, the Council of European Union, which is formed of politicians from each member state based on subject matter, and the European Parliament. Additionally, the EU Court of Justice upholds law and the European Central Bank monitors finances. In most instances, the Commission proposes laws and the Council and Parliament have an equal say on whether or not they’re adopted. A piece of legislative text can be debated a maximum of three times, during these ‘readings’ amendments can be made. Fun fact: Commissioners love ‘making selfies’ just as much as everyone else. For a resolution to be passed, more than half of all MEPs (including those absent and those present but not voting) must agree. If the Council does not approve amendments tabled by the Parliament, a ‘conciliation committee’, comprising an equal number of Council members and MEPs, is formed to agree a compromise. What does the Parliament actually do? The role of the European Parliament is to scrutinise and amend legislative proposals, give budgets the go-ahead and supervise the Commission. MEPs have the power to approve, amend or reject all EU legislation – on everything from employment laws to children’s toys specifications. Following next week’s election, the number of seats in the Parliament will be reduced from 766 to 751 (750 plus the president). The maximum number of MEPs per country is 96, while the minimum is 6. After 23 May, Ireland will lose one MEP – 11 will represent our three constituencies of Dublin (3), Midlands North West (4) and South (4). Germany will have the most MEPs after the election – 96 (down from 99), while Malta, Cyprus, Estonia and Luxembourg have the fewest number of MEPs with six each. The UK will have 73 members. MEPs elected next week will officially begin their term in office this July. The minimum age of candidates is 18 in most member states, but 21 in some. In Romania it’s 23 years of age, rising to 25 years in Italy and Greece. In the 2009 election, the gender balance ratio in the Parliament was 65:35 in favour of men. There are 20 standing committees in the Parliament, covering topics such as transport, disability and agriculture. It is here that negotiations over legislation takes place. MEPs can also be members of interparliamentary delegations in order to make contacts within the parliaments of non-EU countries. In its last term (2009-2014), the Parliament held 2,821 meetings, conducted more than 23,500 votes and adopted more than 19,000 amendments, rejecting even more. The Parliament elects its own president, whose term is two and a half years. It also elects a vice-president, co-ordinators from each of the main political groups and rapporteurs who pilot legislation. The current President in Martin Schulz, a German politician who is the leader of the Progressive Alliance of Socialists and Democrats. There are seven main political groupings within the Parliament. These groups are not parties, but looser coalitions. MEPs who choose to remain unaffiliated with any group are known as ’non-attached members’ – they currently hold 33 seats (4.31 per cent). Fine Gael is a member of the EPP; Labour is in the Progressive Alliance of Socialists and Democrats; Fianna Fáil is part of the Alliance of Liberals and Democrats for Europe; while Sinn Féin has grouped with the European United Left/Nordic Green Left. In order to form a political group, 25 or more MEPs are required and at least one-quarter of the member states must be represented. Members may not belong to more than one political group. Before every vote, the political groups examine reports drawn up by the parliamentary committees and devise amendments. Following discussion, the group adopts a position. Unlike the situation that can occur under the whip system in place in Ireland, no member can be forced to vote in a particular way. In the Parliament’s history, no single group has ever held an overall majority. However, the larger groups do have more influence. The Parliament cost €3.10 per citizen annually to run, making it cheaper to run per capita than Germany, France, the UK and the US. Since 2009, all MEPs receive a basic salary of about €84,000 plus expenses. At present the Commission is often criticised as undemocratic because it is not directly elected. In a bid to soften this view, the Lisbon Treaty passed a directive that will allow citizens to indirectly influence who becomes the next President of the Commission. When member states nominate José Manuel Barroso’s successor later this year, they will have to take into account the European election results for the first time. The Parliament hopes this move will help tackle low voter turnout. In the 2009 election, the average voter turnout across the EU was 43 per cent, a drop of 2.6 per cent from 2004. Voter turnout in Ireland in 2009 was 57.6 per cent, down 1 per cent on 2004. If you are not in your country of residence on the day of the vote, most countries allow their citizens to vote abroad. This is mainly done in embassies or via post, but Estonia allows e-voting. There is no option for Irish citizens to vote abroad. In the thirty year period from 1979-2009, the number of registered electors increased from 180 million people to 390 million people. However, the number of people who voted only rose from 110 million people to 170 million people. Within this period, the population of the Union almost doubled – jumping from from 260 million to 505 million. Email “Everything you need to know about the European Parliament but were afraid to ask”. Feedback on “Everything you need to know about the European Parliament but were afraid to ask”.